In all the bloody history of the Papacy, perhaps in no one man, as in Abraham Lincoln, was there concentrated such a multitude of reasons for his annihilation by that system. In all the history of the political assassination plots by the enemies of freedom, which for cold calculation, malicious methods, relentless pursuit, subtle cunning, and cowardly execution, nothing can exceed the cruel murder of this greatest of all Americans—for President Lincoln was the living, breathing type in which was fulfilled the triumph of the New Concept of Popular Government, the central postulate of which is, the consent of the governed. It was the life of Abraham Lincoln, which placed this form of government forever outside an "experiment" where its enemies persisted in endeavoring to keep it. That a barefoot, nameless boy on poverty's path could, by his own efforts, reach the highest office in the gift of the American people, gave the lie to the "Divine Right" croakers, and merited their most unceasing hatred. Barring the martyrdoms of Jesus Christ and Joan D'Arc, the methods used in Abraham Lincoln's assassination will stand preeminent in point of malice and cruelty, and, strange as it may seem, the same diabolical cunning which nerved the hand of the assassin has pursued Lincoln beyond the grave, and has been largely successful in hiding from the public all details of his physical destruction, a crime, in the eyes of the writer, which almost outstrips the first, for by this conspiracy of silence on his death, the youth of America are being deprived of the knowledge of the details of the greatest tragedy in their country's history. This appalling fact has been the one big urge which inspired the writing of this book, the contents of which represent only a part of the result of leisure hours spent in public and private libraries in the various cities, covering a period of the past seven years—gathering a fact here and one there, from books, magazines, newspapers and court records, filing them away, and finally condensing the salient points between the covers which you now hold in your hand. 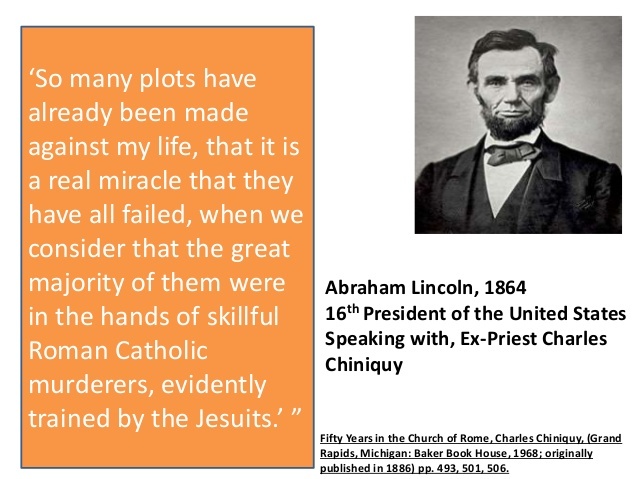 I feel safe in stating that nowhere else can be found in one book the connected presentation of the story leading up to the death of Abraham Lincoln, which was instigated by the "Black" pope, the General of the Jesuit Order, camouflaged by the "White" pope, Pius IXth, aided, abetted and financed by other "Divine Righters" of Europe, and finally consummated by the Roman Hierarchy and their paid agents in this country and French Canada on "Good Friday" night, April 14th, 1865, at Ford's Theatre, Washington, D.C. I am convinced that if this knowledge can be given adequate distribution and placed in possession of the boys and girls of the public elementary schools, for whom it is especially designed to reach, that the wicked boast of the Jesuits and their lay agents, the Knights of Columbus, to "MAKE AMERICA CATHOLIC" can never be accomplished. THE GREAT SPIRIT OF THE MARTYRED LINCOLN WILL RISE UP AND DEFEAT HIS SLAYERS AND THEIR SUCCESSORS! In closing, I only ask each reader whose heart beats in unison with those of us who love our country and all that it represents, to assist in the sale of this little book, by giving it all the publicity possible, thereby joining in President's Lincoln's expression of loyalty. "If ever my country is destroyed. it shall be my proudest plume, not that I was the last to desert her, but that I NEVER DESERTED HER!"